Amid the onslaught of anonymous political donations, some grassroots activists are gearing up for a counteroffensive. Here are five promising strategies for 2016 and beyond. As the 2016 election season heats up, there is little doubt that dark money will once again dominate and distort the electoral process. In fact, the system through which candidates secure unlimited contributions from anonymous donors seems more sophisticated than ever, with total donations likely to rival the $600 million that flooded the previous three election cycles combined. Nearly half the Republican presidential hopefuls have already lined up “independent” nonprofit organizations to bolster their candidacies—flagrantly running afoul of Internal Revenue Service rules that say politics can’t be the primary purpose of such groups. Conservative candidates for president and Congress are groveling before the Koch brothers and the wealthy donors to their dark-money group Freedom Partners. The US Chamber of Commerce is raising gushes of money from corporations seeking to influence lawmakers without exposing their identities to shareholders or consumers. And as it has done in previous election cycles, the Chamber is poised to link arms with Karl Rove’s American Crossroads network to keep both houses of Congress in Republican control. About these groups’ secret spending, the IRS will do precisely nothing. Hounded by the right, which whipped up a faux scandal out of a clumsy attempt by overwhelmed staff to police groups with “Tea Party” in their names, the tax agency recently decided not to even try to rein in such blatantly out-of-bounds activity. Even the best hope for sunlight—that President Obama will sign an executive order mandating disclosure for government contractors—would still leave many corporate donors free to buy influence via campaign ads. While the entrenchment of dark-money groups supplies good reason to despair for democracy, some forward-looking activists have seized the moment as ripe for a counteroffensive. Important opportunities are taking shape at the grassroots, responding to corporate speech with public speech, countering TV ad blitzes with voter-to-voter outreach, matching big-dollar donors with scads of small contributors, and replacing a passive electorate with an active, empowered citizenry. Shareholder resolutions: On those rare occasions when a company’s fingerprints surface on a dark-money donation, odds are that the enterprise is a publicly traded corporation. Take the insurance giant Aetna, which gave nearly $4.5 million to the US Chamber of Commerce in 2011—empowering the same group that had routed Democratic incumbents with vicious attack ads slamming them for their votes in support of the Affordable Care Act. When the Securities and Exchange Commission failed to respond to a petition with more than a million comments demanding public disclosure of corporate political spending, pension funds and others with large holdings in Aetna took matters into their own hands. Pleading with Aetna to voluntarily disclose its contributions didn’t get the insurer to budge. So New York State Comptroller Tom DiNapoli sponsored a resolution that would have required the company to reveal all political spending, including to dark-money groups. The measure went down to defeat earlier this year, two to one, but even that showing puts continued pressure on Aetna to come clean. 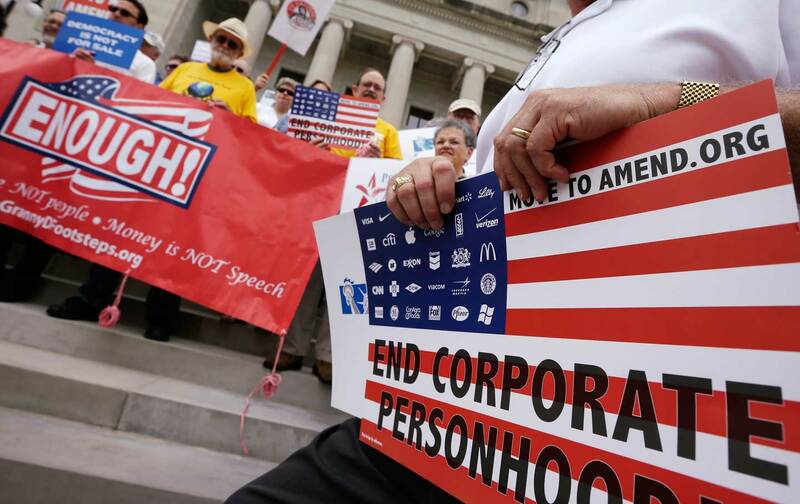 Similar shareholder efforts have prompted companies to disclose, voluntarily or via vote, all political spending—including, sponsors hope, dark money. Among the companies that have agreed to greater transparency on this issue are Qualcomm, CSX, United States Steel, Peabody Energy, and Marriott—many of which are key US Chamber donors. Money-out-of-politics: Another way forward is to beat the big spenders at their own game. Consider the rapid rise and fall of Scott Brown. The 2010 special election that vaulted him into Ted Kennedy’s Massachusetts Senate seat proved a breakthrough moment for dark money, with Brown’s victory secured by a million-dollar US Chamber of Commerce ad blitz. That success helped send corporate donors flocking to fill the Chamber’s coffers for the 2010 general election, during which it flooded contests with $33 million in supposedly “educational” attack ads. Rove’s network added at least $38 million more. Brown’s next chapter showed a fairer way forward. He and challenger Elizabeth Warren signed a nonaggression pact, in which both agreed to renounce outside spending. If an outside group persisted, the benefiting candidate would have to donate half the cost of the ad buy to the charity of his or her opponent’s choice. The deal worked—ousting Brown in the process—and provided the germinating idea for CounterPAC, which proposed similar agreements in some 2014 races and promises to gain momentum in 2016 with support from its Silicon Valley founders. Also in the fray will be Mayday.us, which is committed to electing sympathetic congressional allies through crowd-sourcing and donor pledges. Former New York gubernatorial candidate Zephyr Teachout, whose insurgent campaign against Andrew Cuomo drew attention to the harmful influence of money in politics, took the organization’s reins from founder Lawrence Lessig in August. Dismantling glass houses: Organizations on the losing end of the dark-money blitz are themselves part of the problem. Groups like Everytown for Gun Safety (outspent 72-fold in 2014 congressional elections by the National Rifle Association) and the League of Conservation Voters (fighting uphill regulatory battles against the Chamber and the Koch brothers) feel compelled to stay in the anonymous-donor game for fear of unilateral disarmament. By keeping silent on dark money’s threat to democracy, such progressive groups help keep the reform movement marginalized. So it’s a hopeful sign that during the 2014 election cycle the League of Conservation Voters spent nearly as much from its Super PAC—with donors fully disclosed—as the $9.6 million it did from its dark-money account. Policy reform groups should be encouraged to push even further with a promise to keep all donations out in the open. By becoming partners in the movement to rein in dark money, these groups will not just help their own causes but will also help broaden support for a campaign urging voters to renounce candidates backed by backdoor-corporate-spending blitzes. Public financing: Modeled on highly successful, time-tested systems in New York City and Connecticut, both of which originated in response to corruption scandals, Maryland Representative John Sarbanes’s Government By the People Act would provide a tax credit for small donations and match them six-to-one for candidates who agree to abide by a spending cap. With 151 Democratic sponsors and just one Republican, it has zero chance of becoming law in the current Congress. But by highlighting a viable, road-tested way to amplify the voices of small donors, the bill shows voters a fresh path forward and sets a standard by which they can hold candidates to account. Clash of the titans: Finally, it’s important for activists to remember that dark money has the power to defeat itself. Some Republican primaries promise to pit the business faction of the Republican Party against its Tea Party fringe, draining both of resources and bloodying their candidates heading into the general election. As it did in 2014, the US Chamber is planning to spend potentially hefty sums in the 2016 Republican primaries to eliminate candidates the group considers hostile to big-business priorities, and has already spent $2.3 million. In the face of the secret-money scourge in our elections, the worst course of action would be to passively wait for a regulatory rescue. That day may not be coming anytime soon. But the time for action—any action and every action—has arrived. Alyssa KatzAlyssa Katz, a member of the New York Daily News editorial board, is the author, most recently, of The Influence Machine: The U.S. Chamber of Commerce and the Corporate Capture of American Life (Spiegel & Grau, 2015).